Your Dog Digging Holes in Your Yard? Stop it Now! My Dog Digging Holes in the Yard Has Me Irritated! Do you have a dog digging holes in your yard? Well, I do. My dogs dig with such gusto that I began to wonder if they had some odd compulsive disorder. Digging holes in the garden was mildly annoying to me. But then, that mild annoyance escalated into outright anger when the dog dug up some flowers I had just purchased. I needed to do something, so like many of you, I did a quick internet search for why dogs dig. I wanted answers and solutions immediately. As current “theories” suggest, dogs left outside alone in a yard for any length of time will dig because they have nothing else to do. The obvious solution to a bored dog digging holes is to give the dog something to do, but read on. Closely related to boredom, dogs that suffer from separation anxiety will dig to reduce the anxiety they feel when their human leaves. Some may also dig under a fence to locate their lost human. As the old saying goes, the grass is always greener on the other side of the fence. Intact animals will dig to escape and find a mate. Fixed dogs just want to see what the neighbor is doing. Dogs that dig to escape hate to be confined. The advice provided for this possible digging dilemma is to get the dog fixed or repair your fence. Dogs dig because they are hot, so digging deep into the earth will provide a comfortable, cool den for every hot dog to snooze. Most experts that purport this explanation seem to leave conveniently out the part where the same dog also digs in the snow. Those dog specialists that like this model, maintain that dogs are great savers. They will save for a rainy day when they might need a bone. From an evolutionary point of view, our ancient dogs/wolves would bury any uneaten food so it would remain safe for a time when food sources were scarce. Some dogs bury items inside. They will hide toys and bones in their beds or places where they determine to be out of reach of humans. It is true that many small terrier breeds were developed to burrow under ground to protect farms and rid the area of dangerous vermin. Certain terrier breeds helped farmers do this important job back in the 19th century. It is difficult to remove these inbred tendency in dogs even 21st century dogs. Whether the dog is actually hungry or not, some will dig holes to munch on soil, roots, stones, or other inedible material. It is true that a dog that is underfed will look for food—anything that could be edible. If nutrients are missing in the dog’s diet, they may have a craving for that substance and find relief by chewing on roots or small sticks. Dirt may provide nutrients but may also supply your dog with a hefty source of pesticides, fertilizer and harmful microscopic organisms. This seems to be purely instinctual and not breed specific. Just prior to whelping a mother dog will begin digging anywhere she feels would make a good nest for her puppies . If mama is outside, dirt is a logical medium, but if inside, your laundry basket, the carpet under your bed, or a dark place in your closet will also suffice. This behavior can also be extended to dogs that dig a little before settling down for a nap. Digging at their bed or yours, just to make the perfect den for sleeping is a behavior that predates modern dog ownership. It is hard to remove these inborn tendencies. Dogs dig because it is fun and a form of exercise. The reward is the behavior itself. 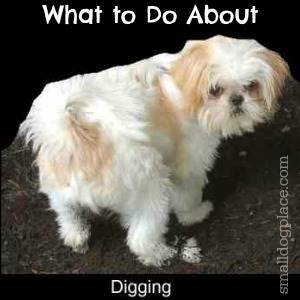 Once a dog gets the “digging bug” it is hard to stop it. Digging as a way to amuse oneself is likely a learned behavior. One dog views another dog that is digging and wants to join in the fun. Soon both are digging for the sheer pleasure of how it feels. When they reach a root, it becomes a tug-of-war game that could go on forever. If a worm wiggles out, the curious dog gets an additional source of amusement. 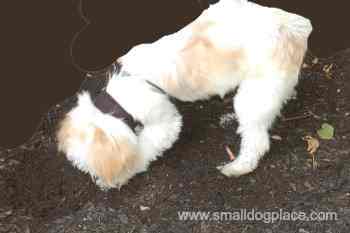 Why is My Dog Digging Holes? She’s not left alone outside and will dig a hole whether I’m present or now. She has a full time human at home with her and the company of 13 other dogs. She digs in the middle of the yard far from any fence. She is an otherwise, smart dog, so escape is not a likely explanation. She likes to dig in the dirt in the summer and the snow in winter. I’ve never seen her actually lie down in her holes. Besides, if she gets hot, she walks right through the doggie door into air conditioning. I’ve never seen her bury a bone or toy, inside or out. 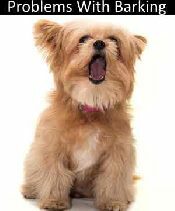 She is a Shih Tzu, a breed that has been bred for millennium to be a companion dog only. She gets two big meals a day, snacks and has access to bones to chew. Unless there is a nutrient missing in her diet, she isn’t digging for something to eat. She’s only seven months old: Too young to be a mother. She watched another dog dig a hole when she was a small puppy. She watches mama dogs dig. She tries it out and it feels good. She’s hooked! Some of the reasons given above make more sense than others. There will always be at least one dog that digs because of each explanation, above, but the trick is to find out which explanation best fits your dog. 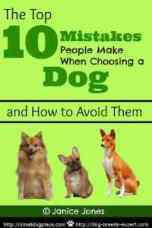 Once you have eliminated most possibilities, one logical solution might stand out and that is how you either reduce or eliminate the behavior or provide an alternate solution that will be acceptable both to you and your dog. Dog Digging Holes is a normal behavior for dogs. Some of it is instinctual and some results from years of breed development. Dogs learn from each other and they learn from us. Young puppies absorb information from their mothers long before their eight-week birthday. Some of these learned behaviors are difficult to extinguish. Digging behavior is part of us too whether we’d like to admit it or not. Gardening requires digging. If we have kids, we watch them dig in the sand at the playground or help them build sandcastles at the beach. We don’t question our kids need for sand or our desire to pick up a shovel. Certain breeds are more likely to dig than others. For example, terriers as mentioned above were bred to capture underground prey, such as moles, hedgehogs and badgers. Dogs that live mainly outdoors without adequate ways to cool off may dig. Holes that are only several inches deep provide some relief from heat. Likewise, a hole several inches down can feel warmer in cool weather. A rounded out hole can make a perfectly comfortable bed. Some breeds are prone to running and chasing. Dogs that have been bred to chase may take off at the first sight of a squirrel. If the fence that holds them back interferes with this behavior, they may take to digging under the fence. A small depression near a fence or wall is all it takes for a dog to dig their way to the other side. Some dogs do bury bones, toys, chews or small pieces of food. Whether this is a remnant of the ancestral dog’s survival mechanism or a more recent learned behavior remains to be researched. Mother dogs will dig prior to and after they have whelped a litter. This is an inborn tendency that has been passed down from the wolf. A den would keep the puppies warm in the winter and cool in the summer and would provide protection from predators. Modern mother dogs don’t require this but the behavior persists. Do not leave a dog alone for extended periods of time. They need human companionship no matter what breed of dog you have. If you can’t be home at lunch time, consider hiring a dog walker or investigate what types of dog day care are available in your area. Make sure your dog has time with you every day. Hire a dog walker or consider dog day care. Play calming music for your dog while you are away. Read up on Separation Anxiety and use the methods provided to help your dog cope with being alone. Walk the length of your fence, looking for possible escape routes. Add additional fencing material around the base such as chicken wire or plastic mesh. Provide a comfortable bed: Dog prefer a bed with a raised side that can be used as a pillow. Some dogs prefer a small bed that they can curl up in tightly. A well insulated dog house and warm bed are a must if dogs stay outside in cool weather. This is just a couple of examples of cooling beds. There are many more on Amazon from which to choose. Provide a box for toys; Teach your dog to drop toys in the box. Do not allow the dog to take toys outdoors with them. Feed only what your dog will eat at a given time. Pick up any uneaten food. Remove bones after dog is finished. Raw bones can be kept in the freezer or refrigerator and given to your dog when he is ready to for them. If treats are not consumed immediately, remove them and save for later. For breeds that find small rodents irresistible, you might want to consider safely removing some from your property in a humane way. If this is not an option, fence in an area where your dog may not come in contact with them. Squirrels, chipmunks and mice learn very quickly where they can and cannot go and will likely stay as far away from your dog as is possible. A fence is a must if you have a breed that enjoys chasing or digging for rodents. 1. Hunger is usually not a problem in modern day families. The opposite, obesity, is far more frequent. 2. 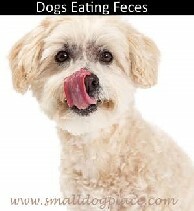 Evaluate how much food you are feeding your dog. If he is on the lean side, consider offering a slightly larger portion. 3. Evaluate the dog food. Is it a high quality brand? If not, consider changing to a better food. 4. Add an additional daily meal but be sure to divide up the portions accordingly. 5. 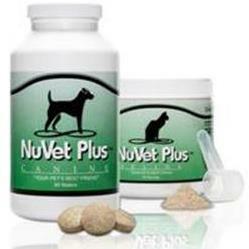 Hunger or lack of nutrients may not be the problem: Maybe the dog has an oral fixation. If so, provide more opportunities for your dog’s cravings: bones, chews, soft toys, hard toys, or other safe objects that the dog can safely carry around in his mouth. 6. Discourage your dog from eating dirt if you catch them in the act. Use words such as “No” or “Leave it.” Dirt can be dangerous to dogs. Provide whelping box with sheets, towels, rags or paper that they can shred, dig, and spread around. Provide a safe place to dig. Provide a sand box or area where digging is permitted. Praise him when he digs in appropriate areas. Use garden fencing to enclose areas where digging is not allowed. Provide additional time for exercise and rigorous play. 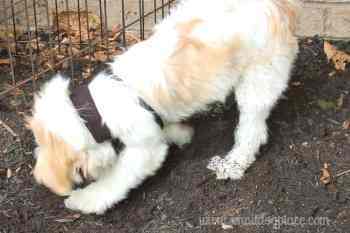 Don’t fill the hole with dog feces: It is likely that the dog will find another place to dig. Don’t fill the hole with water and force the dog’s head under the water. If all fails, you may want to call your veterinarian or enlist the help of a canine behavioral specialist. 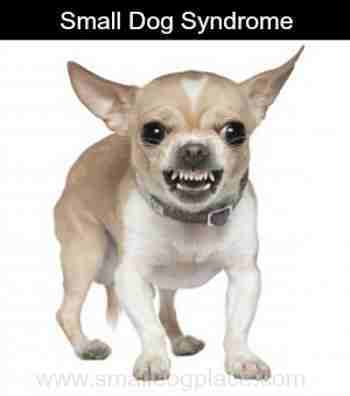 Find out if your dog is suffering from Small Dog Syndrome. Coprophagia: Learn how to deal with this nasty habit.